This tray can hold fourteen Space Marine Bikes, two Attack Bikes and three Speeders. 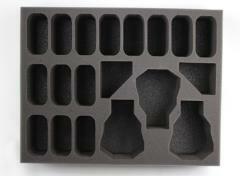 This tray is ideal for armies such as White Scars, Raven Wing or any army with a lot of Space Marine Bikes. 3 inch (76 mm) thick tray with 14x 3 x 1 1/2 inch (76 x 38 mm) cut outs.